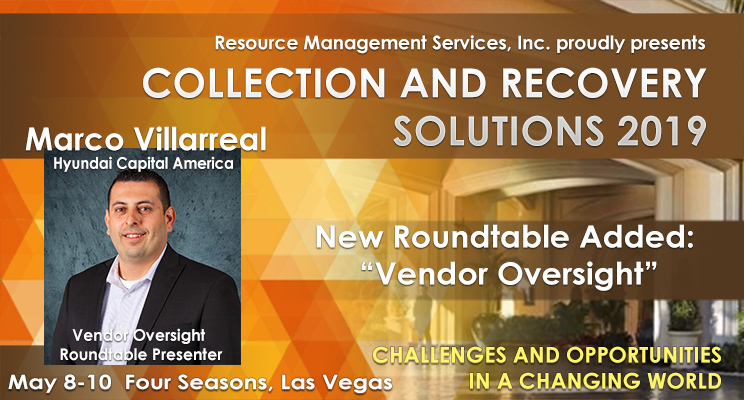 Marco Villarreal of Hyundai Capital America joins our distinguished panel of speakers as a roundtable presenter on Vendor Oversight at Collection and Recovery Solutions 2019. Rulemaking, compliance, regulators, collection strategy & analytics – and a focus on Challenges and Opportunities in Our Changing World – it’s an event you won’t want to miss. Plus – special focus on peer meetings – Auto Finance Peer Group, Recovery Management Network, FinTech Collections Lender Peer Group, Credit Union Peer Group and Millennial Peer Group (Collections and Recovery). Our Keynote speaker is Forbes Publisher, Rich Karlgaard, “Best Practices in Business Adaptability”. Other roundtables include: Bankruptcy, Debt Sales, Collections in China, Hiring, Operationalizing Analytics, Optimal Collection Performance, Auditing and Synthetic Fraud.